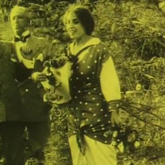 Oxilia, Menichelli, 1915: two short films | Silents, Please! 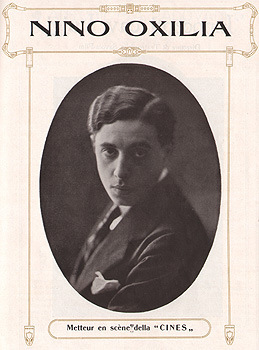 Until his career was cut short by World War I, Nino Oxilia was one of the most promising Italian directors of the teens. Formerly a playwright, he entered the world of moving pictures in 1912 and trained in Turin under Ubaldo Maria Del Colle at Pasquali and Mario Caserini at Ambrosio, then directed for Savoia-Film before moving to Rome to work at Celio. He was a gifted director of sophisticated melodramas and considered a top talent—I’ve previously covered two of his major works, Sangue Bleu with Francesca Bertini (Celio 1914) and Rapsodia Satanica with Lyda Borelli (Cines 1917). Oxilia also collaborated with the other member of the holy trinity of Italian film divas, Pina Menichelli. In 1914-15, Oxilia was working for Cines in Rome, both as a director and writer; Menichelli was one of the main actresses at the Cines studio during this period. 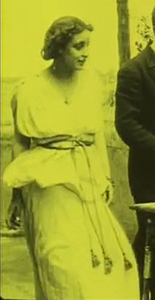 In 1915, Oxilia directed Menichelli in three films: Papà; Per amore di Jenny; and Il sottomarino n. 27 | Submarine no. 27. Although the latter title seems lost to history, the first two survive and are available to watch. This blog post, therefore, will look at these two titles in relation to Pina’s star persona as well as Oxilia’s techniques of direction. 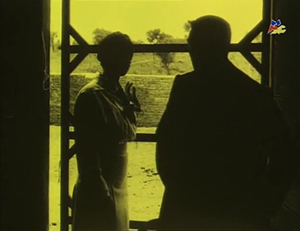 There are a number of similarities between the two films: both feature Pina Menichelli and Amleto Novelli in the primary cast, have a plot revolving around a love triangle, and place a strong emphasis on pastoral and outdoor scenes. In Per amore di Jenny, Menichelli plays a noblewoman caught between the interest of several men: Baron Burg, who she loves; Baron Galdi, who desires her; and Mario, a blacksmith whose singing brings her pleasure, and whose hopes are dashed by her marriage to Baron Burg. Papà is a more comedic film where Giorgetta (Menichelli) is caught between a father and son, and more broadly, two ways of life: the Count di Larzac, Parisian man of leisure, and his rustic son Giovanni, who has been living in the same rural village as Giorgetta. This film is an adaptation of a 1911 three-act stage comedy by Robert de Flers and Gaston Arman de Caillavet, also called Papa. In Per amore di Jenny, the hinted-at love triangle (quadrangle?) never quite eventuates – Jenny has no interest whatsoever in Baron Galdi, and while she undeniably forms a connection with Mario, to me it read as mostly unrequited on his part. It’s not a case of star-crossed lovers, but the audience is left with the question of what could have been for the two of them, in different circumstances. Mario is heartbroken, while Jenny moves on without too much ado. Jenny’s interest in Baron Galdi; Mario the blacksmith. There is one strange shot where Jenny appears to try to yank her arm free of his in annoyance – I’m not sure if it’s a gesture that came off wrong, or the actors actually mucking up. In any case, this section of the film was clearly designed as a showcase for the Roman locations, and it’s understandable – the shots showing Roman arenas and historical places are very striking. As the Count casts off his bachelor life and prepares to embrace his son, Giovanni has been courting Giorgetta. 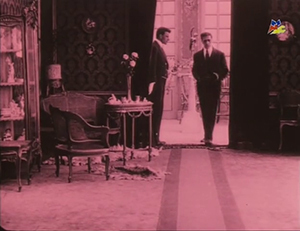 After Giovanni arrives in Paris, where he is less-than-thrilled with the lifestyle (intertitle: “The joys of family! Giovanni was deeply bored.”), he receives word that Giorgetta has said yes to his marriage proposal. The Count is displeased and forbids Giovanni to marry her, so the latter throws his hands up and leaves Paris (“What! I met him yesterday and he already forbid me to marry the woman I love? I was better off without a Dad … I’ll go back to Gerac!”). But once the Count summons Giorgetta and she assures him that she isn’t after Giovanni’s money, he warms to her … a little too much. The rest of the action takes place back in the village of Gerac, and it’s interesting to note the different ways in which Giorgetta interacts with each of the male characters: she’s more demure around Giovanni, while the Count brings out her flirtatious side. Giovanni becomes increasingly jealous of his father’s attentions to his fiancé, and the Count decides to remove himself from “a situation which has become a little too complicated”—but things resolve themselves in a happy way, in contrast to the more poignant ending of Per amore di Jenny. Can we call either of these pictures a diva film? Not really – they are only short films, in one of which Menichelli does not play the main character, and in neither case does she have the passion and vitality – and the centre stage – that I associate with haute divadom. Still, I detected some proto-diva elements in Jenny and Papà. Regular readers will know that I break down diva films according to the components that I have scientifically determined to be essential to the genre – let’s try this here and see how these films stack up. Copious costume changes. 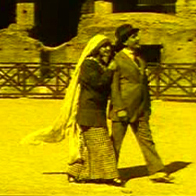 In both films, Menichelli wears about 5 different outfits, or around one per 3.5 minutes and 5.5 minutes respectively. My favourite was an outfit that, in fact, she wears in both films: a pale dress + necktie + polka-dotted tunic combination. I see a lot of stripes in films of the teens, but I don’t recall seeing polka-dots often. However, Papà undoubtedly wins this category with this incredible winged hat worn by a side character. A dramatic scene involving flowers. Jenny has picked some flowers for Mario, and when Baron Galdi expresses interest in her floral endeavours, she is not impressed. 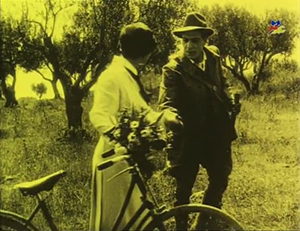 Flowers feature several times in Papà: we see Giorgetta playfully leave one of her bicycle flowers on the desk for Giovanni while his back is turned; she also teases his father with her bouquet in a later scene. When they are playing hide-and-seek in the countryside, she drops flowers from a tree to attract the Count’s attention. However, most of the other diva elements are MIA: veils, exceptionally long necklaces, mirrors, symbolic naming, and feminine sufferance. The latter especially: both Jenny and Giorgetta ensnare the hearts of men effortlessly, and both can be flirtatious, but the narrative doesn’t punish them for this, and in fact, each character gets a happy ending. Giorgetta’s knowing look to Giovanni at the film’s conclusion seems more like acceptance than triumph, since he himself has partnered with the beautiful goatherd who loves him. Pina Menichelli’s star persona was still in development: she is more natural here than I’ve seen her in other pictures, without only small glimpses of the gleeful and stylized flamboyance (what I’ve called Menichellismo) that she would develop in later films. Far from the predatory poetess stalking the marshes in Il fuoco, in Papà she is a fresh countryside beauty, complete with her bicycle adorned with flowers. Her role in Papà is secondary to those of Novelli and Ruggeri, as the story is ultimately about a father and son; in Jenny she is much more the main character, but one who again exists mostly in relation to the men in the plot, rather than emerging as a truly distinctive personality. 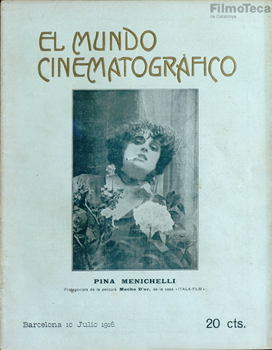 It would take Menichelli’s move to Itala-Film and participation in the astonishing Il fuoco (completed towards the end of 1915) to show the public what she was really capable of. Il fuoco | The Fire (1915): I called it “a film so atmospheric as to be surreal, representing the height of D’Annunzian decadence”. 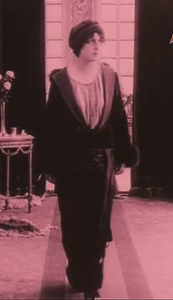 Menichelli in another femme fatale role, as a “modern-day Messalina” in La moglie di Claudio | The Wife of Claudius (1918). Nino Oxilia directs Lyda Borelli in Rapsodia Satanica (1917), a decadent update to the Faust legend. Francesca Bertini stars in Oxilia’s Sangue Bleu | Blue Blood (1914), a visually rich melodrama about a noblewoman who loses it all. Per amore di Jenny [NL: Het was een droom | It was a dream]. Dir. Nino Oxilia. Rome: Cines, 1915. Survives in the Desmet collection of EYE Filmmuseum. Digital copy runs 18’41”. Originally released January 2015, according to IMDb data. Papà. Dir. Nino Oxilia. Rome: Cines, 1915. Preserved by the Museo Nazionale del Cinema Torino. It was restored in 2012, and can be watched here on Vimeo (duration: 28’30”). Originally released 07 Oct 1915. This post is my contribution to Shorts! A Tiny Blogathon, hosted by Fritzi at Movies Silently. Read the other entries here! 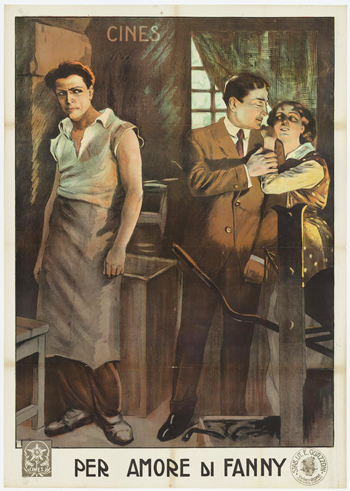 This entry was posted in Film and tagged Amleto Novelli, blogathon, cinema of 1915, cinema of Italy, Desmet collection, diva films, Museo Nazionale del Cinema, Nino Oxilia, Pina Menichelli. Bookmark the permalink. Thank you! More wonderful info about the Divine Ms. Menichelli, my new idol! Glad you enjoyed this rather obscure post! It was interesting to look into Menichelli’s work before she became la diva Pina. I remember your essay on “Rapsodia Satanica.” It was nice to read about more Oxilia/Menichelli collaborations. His death in the war was a great loss for cinema. Thank you! Yes, it’s a huge shame that we will never know what he would have achieved. I agree that the costumes are wonderful – often silent movies seemed to have been shot in ‘day clothes’ but these look almost styled. Wonder if I can find a similar polka-dot style in time for my trip! That winged hat is a winner! I love it! These sound like great films but, more than that, they look beautiful!. I was getting lost in your photos and gifs, examining the costumes (especially the hat) and the scenery. That tracking shot with the car looks really impressive. Pingback: Diva December begins with a rainbow | Silents, Please!